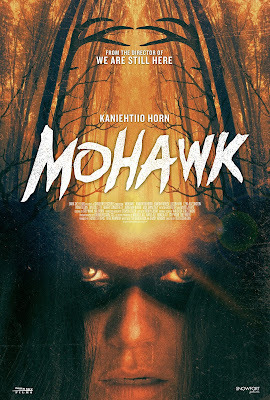 Dark Sky Films has announced the home video release date for Mohawk. It was written by Grady Hendrix and Ted Geoghegan, directed by Geoghegan (We Are Still Here), and stars Eamon Farren (Twin Peaks), Kaniehtiio Horn, Jonathan Huber (WWE’s Luke Harper), Justin Rain (Defiance), Noah Segan (The Mind’s Eye), Ian Colleti (Preacher), Robert Longstreet, Sheri Foster and Ezra Buzzington (The Hills Have Eyes, Crossbones). It will be released on Blu-ray and DVD by Dark Sky Films on April 10th. Check out the synopsis and trailer below.